Electrostatics 3D is an interactive software program that allows students to study electrostatics in a visually spectacular fashion! Opposite point charges and their associated electric-field lines shown in three-dimensions. All 3D graphics can be rotated about multiple axes to produce a stunning real-world perspective. Multiple point charges may be positioned anywhere in 3D space. Zoom feature permits fascinating views that can be generated at a distance or from within the center of the field. Three-dimensional view of a grounded conductive sphere and point charge. 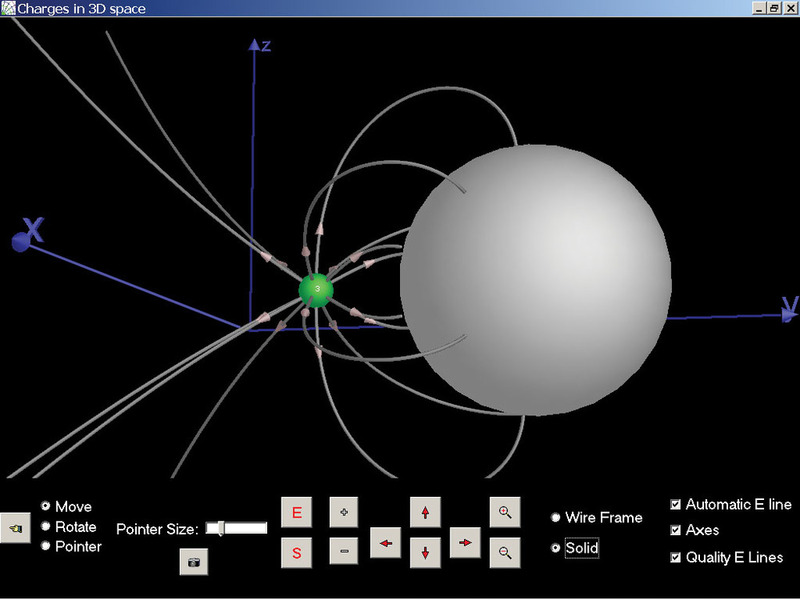 The user can select the size of the conductive sphere and whether it is grounded or isolated. The cursor can be positioned at any x,y,z location to obtain the precise magnitude of the magnetic field. Two-dimensional display of electric field surrounding oppositely-charged parallel plates. 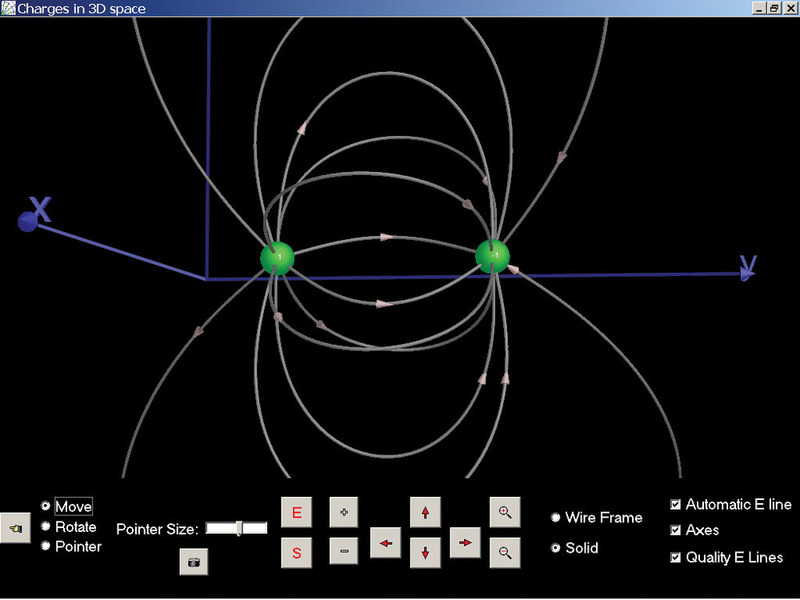 Electric field vectors can be displayed at any selected location. 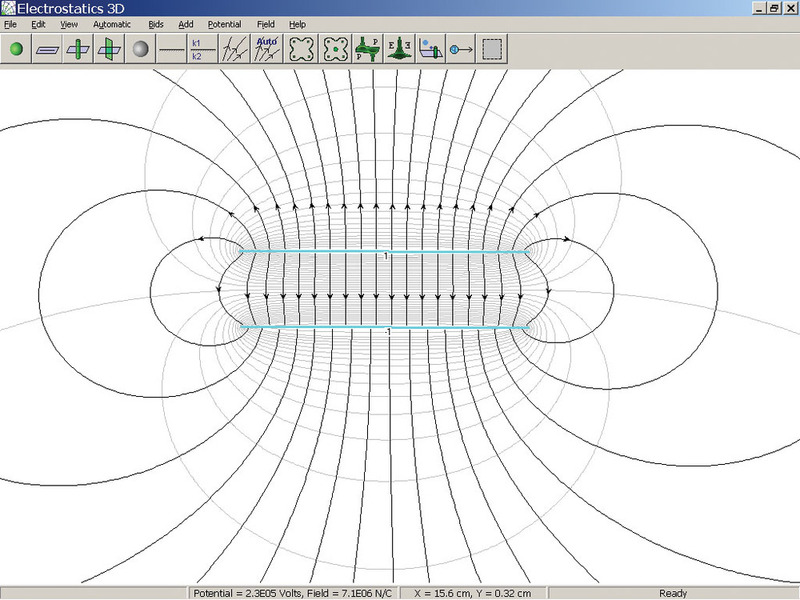 Three-dimensional view of an equipotential surface produced by a pair of like, but unequal, point charges. Equipotential surfaces can be drawn from any selected location in 3D space. Three-dimensional topographic mapping of electric potential surrounding a pair of opposite point charges. The 3D graphic can be rotated about multiple axes. Color-coded display indicating the strength of the electric field surrounding three point charges. Sampling of screen images, hover over image for description. Electrostatics 3D is an interactive software program that allows students to study electrostatics in a visually spectacular fashion! Electrostatics 3D utilizes colorful two-dimensional and three-dimensional graphics to display electric potential and electric field lines for various types of charged objects. The stunning imagery brings a deeper understanding to electrostatics that has never before been achieved by other software visualization methods. In addition to displaying charges, electric field lines, and equipotential surfaces in 3D space, three-dimensional topographical mapping is also utilized providing a highly-informative perspective. All the various types of three-dimensional graphics can be rotated in space about multiple axes for a true 3D perspective. The user is provided with a wide variety of simple to use tools that permit any desired charge configuration to be created on-screen. Simply click the desired object from the toolbar, input the chosen parameters, and position the object on-screen. View electric field lines and electric equipotential lines & surfaces (electric potential isolines) in a 2D and 3D environment. Choose from a variety of charged objects that may be used in any combination including: point charges, linear charges, plane charges with limited or unlimited length, grounded or isolated conductive spheres, conductive planes and di-electric boundaries. View options include: 2D surface, 3D space, 3D topographic mapping, 2D color-coded mapping & linear integral convolution. Option to display on-screen electric field vectors indicating individual charge contributions and net electric field for any location. Numeric display indicates strength of electric field and electric potential at any location (both 2D and 3D environment). Option to display the path of a charged particle as it moves under the influence of the electric field. Option to use right-handed or left-handed coordinate system in 3D environment. Designed for both high school and college physics courses. 10% discount applied to combined price when purchased with Magnetism 3D.